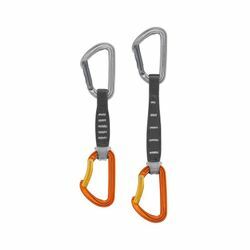 Petzl Spirit Express Quickdraw. Lightweight, versatile quickdraw for rock climbing. Lightweight and ergonomic, the SPIRIT EXPRESS quickdraw is THE benchmark for sport climbing and working a route. The straight gate design offers an excellent grip and makes clipping and unclipping easier thanks to its textured gate and Keylock system. The design of the bent gate allows the rope to be clipped efficiently. The ergonomic shape of EXPRESS quickdraw sling makes it easier to grab. It is available in two lengths: 12 and 17 cm.